Our center is committed to provide the best available proven methods to detect life’s most important illnesses early. Many of our patients self-purchase our procedures without insurance involvement, just as they would spend money on yearly preventive assessment for their automobiles. Many individuals will seek insurance coverage for our procedures -in some cases they are covered. We recognize however that many managed care organizations do not share our interests in prevention and are largely paying only for symptomatic diseases. Frankly, paying for a heart scan is not often financially attractive to an insurance company or HMO unless you have risk factors and your doctor is attempting to make a decision about lifelong medications anyway. Nationwide, after getting a heart scan, thousands of citizens will be encouraged to be on medications (which will be covered) to prevent heart attacks, etc that may not occur for many years -typically after one has changed insurance policies. If you have risk factors for heart disease, ask your doctor to ask your managed care company for “individual consideration” for coverage in order for him/her to make a precise determination of your need for therapy. If your doctor is planning on using this test to make a diagnostic decision or to guide therapy, please print out the “Request for Individual Consideration for Coverage” and give it to your doctor. Your doctor will likely be of more help if he/she does not have to create a time-consuming request for coverage for you. This form will make it easier for your doctor and improve the chances for coverage. You can then submit it to your carrier for consideration in your case. In general, if you have no risk factors and are using the test as a pure screen, it is not worth requesting coverage. The heart scan is an extensively proven procedure available at leading heart centers worldwide. There are many book chapters and articles published proving its accuracy and value. If your company explains to you that the electron beam CT of your heart is “experimental or investigational”, you may want to re-consider your relationship with that organization. We believe insurance companies should never mischaracterize a procedure to defend its policies of non-coverage. Such statements will surely result in forfeiting the only opportunity for thousands to know they are at high risk and need treatment. Front Range Preventive Imaging works with various insurance companies concerning coverage of its procedures. In some cases, preventive heart scans are covered as a screening test. More commonly, the procedure will be covered when a doctor refers to make a decision about therapy or a diagnosis. The procedure code for Electron Beam Tomography of the heart for coronary calcification imaging is 0144T (Calcium Scoring). 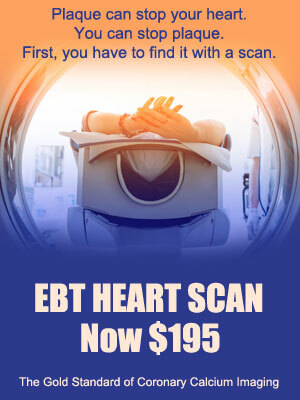 It is always helpful to contact your carrier to find out under which circumstances the EBT heart scan is covered, if at all. If our center has a clear contract with your company (and you meet their guidelines), we will bill the company for the test. Otherwise, we expect payment at time of service. A Health Insurance Claim Form will not be provided. Remember, our center shares a goal with our patients to prevent heart attacks which may occur many years after the 2-3 year average period of time a person stays with an HMO. More enlightened managed care companies develop guidelines so that coverage is determined based upon risk factors, symptoms or in concert with the plans of a referring physician.